Devils Tower is a natural monolith in remote northeast Wyoming in America. It spectacularly soars 240 meters (800 feet) above the surrounding landscape. It is sacred to American Indians, staggering to tourists, and exciting to rock climbers. 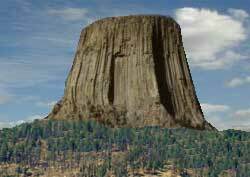 Devils Tower is the place where the alien spacecraft landed in the hit 1977 movie "Close Encounters of the Third Kind". Devils Tower is not flat surfaced, though it appears to be from afar. Its sides consist of hexagonal columns, which nature sometimes creates from magna as it cools and contracts (a process called crystallization). The furrowed columns are up to 2.4 meters (8 feet) wide. For a sense of scale, notice the climber standing on one of the columns in the close-up photo above. It formed 50 million years ago when rising molten rock (magna) cooled and solidified before it had a chance to pierce the earth's surface to create a volcano. (Geologists call the action igneous intrusion).